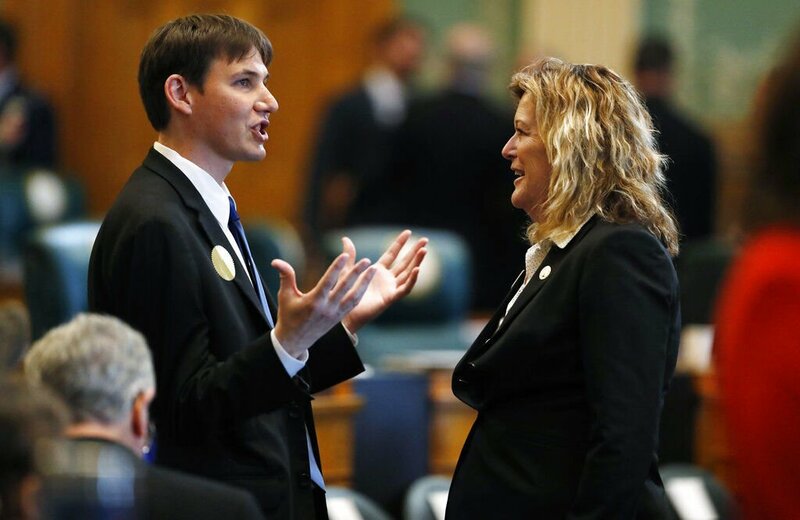 Rep. Tracy Kraft-Tharp, D-Arvada, right, speaks with Marlon Reis, domestic partner of Gov. Jared Polis, before Polis’ State of the State address in January. The 2018 “soft money” campaign for Colorado House Republicans was managed almost exclusively by Rearden Strategic, run by Joseph Neville. One central committee raised “caucus funds” and funneled them to independent expenditure committees also controlled by Neville, the brother of House Minority Leader Patrick Neville, who oversaw strategy for spending the money. Hundreds of independent expenditure committees were active in Colorado’s 2018 election. By law, these committees cannot coordinate with candidates, but they can accept and spend unlimited money to influence voters. In some cases, candidates backed by them have said they don’t like the messages used to support them. Values First Colorado was the caucus fund for Republican House candidates. It operated out of the Rearden Strategic office. For the 2018 campaign, it raised $1.214 million, with top donors from the oil and gas industry, according to the Secretary of State’s Office. Of the $1.214 million raised by Values First, $249,290 went to pay consultants. Rearden got $86,300; Aaron Yates, a Rearden employee, got $17,000. Values First routed more money to at least two other IECs run by Joseph Neville: Coloradans for Secure Borders and the Colorado Liberty PAC. Of the $416,150 raised by the Colorado Liberty PAC, $393,000 came from Values First Colorado. The committee spent $264,580, leaving a balance of $152,009 after final reports for the 2018 election cycle were filed Dec. 6. Rearden and its employees, Joseph Neville and Yates, got $11,416 for consultant services from the Liberty PAC and $239,886 to do advertising on behalf of a dozen Republican House candidates. Of those, 11 lost their races. Among Neville allies backed by the Liberty PAC was Republican Grady Nouis, who lost to Democratic incumbent Rep. Tracy Kraft-Tharp in District 29 by 21 points. Some Republican insiders say the caucus should have saved its money on that race, as Kraft-Tharp has a solid hold on the district. But how much the Liberty PAC spent on that race is unknown, because campaign reports filed by the committee aggregated the money spent for up to a dozen candidates. Some Republicans said the aggregation was a way to hide how much got spent on any one candidate. It allows lots of money to be spent on behalf of one candidate and not so much on another. For example, the Colorado Liberty PAC spent $65,737 on Oct. 2 for direct mail pieces opposing 10 Democrats running for the House, including Lisa Cutter in HD 25 and Kraft-Tharp, who were running against Neville allies Steve Szutenbach and Nouis, respectively. Citizens for Secure Borders, another Joseph Neville-run independent expenditure committee, raised $274,200, all from Values First Colorado, and spent $144,740 on advertising. That left a balance of $129,460 after the last campaign finance reports were filed Dec. 6. Rearden Strategic got $122,374 for advertising on behalf of virtually the same candidates backed by the Colorado Liberty PAC. Another independent expenditure committee, Colorado Moms Who Care, raised $106,700, all of it from Values First, and spent $104,681. Because some funds were left from the 2016 election cycle, the ending balance was $6,454. The advertising purchased by Colorado Moms Who Care was routed through Rearden Strategic. One Republican insider said he doesn’t mind if Joseph Neville and his companies make money off their political activities. But, he said, the lack of election wins for the GOP is another matter. Joseph Neville, in a lengthy response to Colorado Politics, insisted he and his staff were frugal with caucus funds. GOP sources also expressed concern about a large amount of money going unspent. “Spend it to the end” is an expression among soft money groups. You don’t leave money in the bank; you spend the last penny on behalf of your candidates or against their opponents. Not so for the Nevilles and the committees they ran in 2018. After raising $1.214 million, the Values First Colorado caucus-fund committee and its related independent expenditure committees left balances of $305,961, just over a quarter of what the GOP House caucus raised for the 2018 election. By contrast, the House Democrats’ soft money group, Our Colorado Values, raised $3.335 million and left a balance of $13,303, or four-tenths of 1 percent. Political consultants disputed that. One said that kind of money could be spent within 24 hours on walking a district or making calls. Joseph Neville also cited difficulties in lining up paid precinct workers, for which about $120,000 had been budgeted, and said it was “good business practices in today’s political climate” to set aside money for legal costs — “win or lose, we expected to get sued.” He didn’t say for what they might be sued. Still, some Republicans say even modest additional spending in some districts could have helped turn the tide for GOP candidates. Finance filings showed Values First Colorado took in $80,890 in the two weeks before the election. Our Colorado Values took in $134,600 in that period. And the Democrats’ committee had just over $13,000 as an ending balance, compared with the $305,961 left with the GOP’s Values First Colorado.